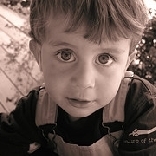 On May 7 2007, at the age of 5 years and 4 months, my son Ethan was diagnosed with Acute Myelogenous Leukemia (AML). He spent 5 months at Children's Hospital Boston. We learned so much... high risk... chemotherapy... pneumonia... the list goes on. The words "bone marrow transplant" sent chills, no... not chills... tremors throughout our bodies as we heard them. And who comes to the rescue? A 3 year old... Eliot... Ethan's baby brother. He saved Ethan's life on August 20, 2007 by donating his bone marrow to his big brother 3 days after his third birthday. Ethan survived 3 rounds of very strong chemotherapy... 8 sessions of total body radiation... and leukemia. We returned home on September 19 having a new appreciation for home, family, and life. We would not be allowed to have anyone in our home until at least May, and Ethan was not allowed to go anywhere else inside, or near crowds, until that time. We will never look at life the same; never have such an appreciation for every day we have together. Support of family and friends helped us get to where we are today. Amazing medical professionals and modern medicine has put our son into remission. We want remission to last forever... we want cancer to be gone forever. This is what I can do to help.